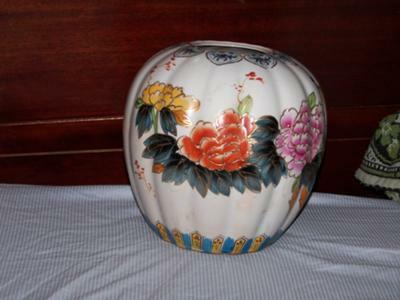 I bought these two Chinese Vases at a yard sale and if I could find some info on them it would be fantastic. They’re very different with one having a seal mark on the base and the other some Chinese script on the undecorated side. Any help or information greatly appreciated. 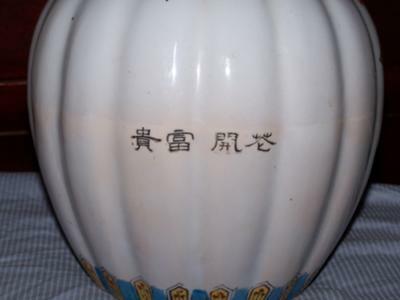 I recognise the characters on the base of the black Chinese vase. 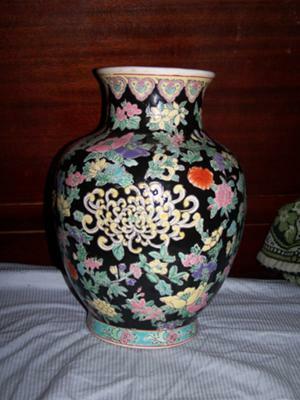 I have exactly the same Chinese vase but have no idea about these and this is the first time I have seen a similar vase. I have had the vase 22 years tho. 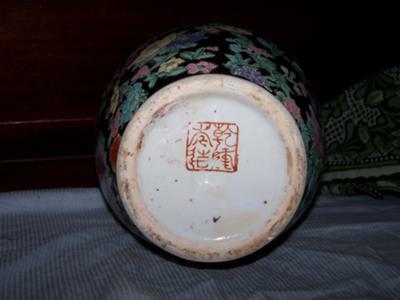 The black vase seal mark is probably Da Qing Qianlong Nian Zhi, which would translate as roughly Chinese Emperor Qianlong period make, but it is probably not Qianlong and could be a relatively recent Chinese vase reproduction from around the 1970’s. Minton Tea Cup & Plate c1930 - Are they valuable?